Survive in a dangerous world. 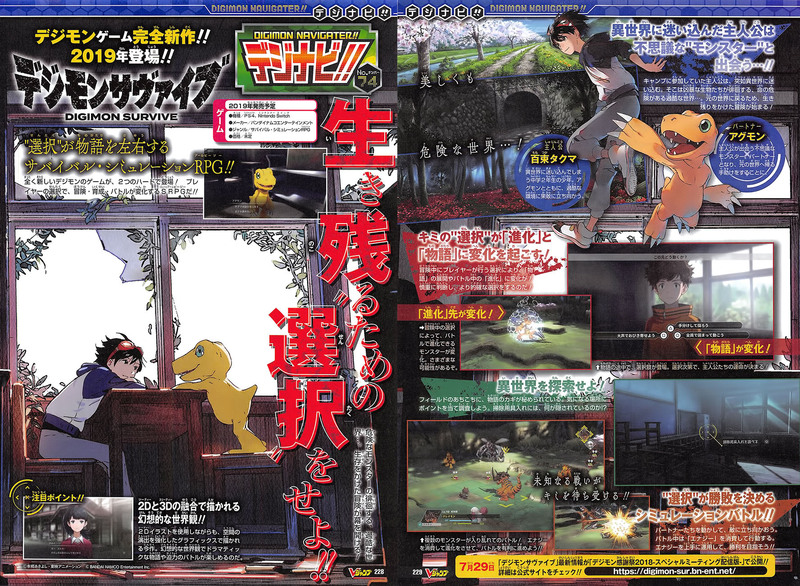 The latest issue of Weekly Jump reveals Digimon Survive, a survival simulation RPG centered on story and choices for PlayStation 4 and Switch. It will launch in 2019. The protagonist of Digimon Survive is a boy named Takuma Momotsuka, a second-year middle school student who is suddenly transported from camp to a dangerous world where life-threatening monsters wander about. Together with his partner Digimon Agumon, he will boldly face his severe situation and embark on a survival adventure in order to return home. The official website will be available here. It should be noted that Digimon Survive is not the new Digimon Story title series producer Kazumasa Habu first teased back in December 2017. Update 10:15 a.m.: Scan added. Update 10:55 a.m.: Updated the story text.